In most of our projects we have dependencies on other code, like libraries or other projects. Gradle has a nice DSL to define dependencies. Dependencies are grouped in dependency configurations. These configuration can be created by ourselves or added via a plugin. Once we have defined our dependencies we get a nice overview of all dependencies in our project with the dependencies task. We can add the optional argument --configuration to only see dependencies for the given configuration. But we can even check for a specific dependency where it is used, any transitive dependencies and how the version is resolved. 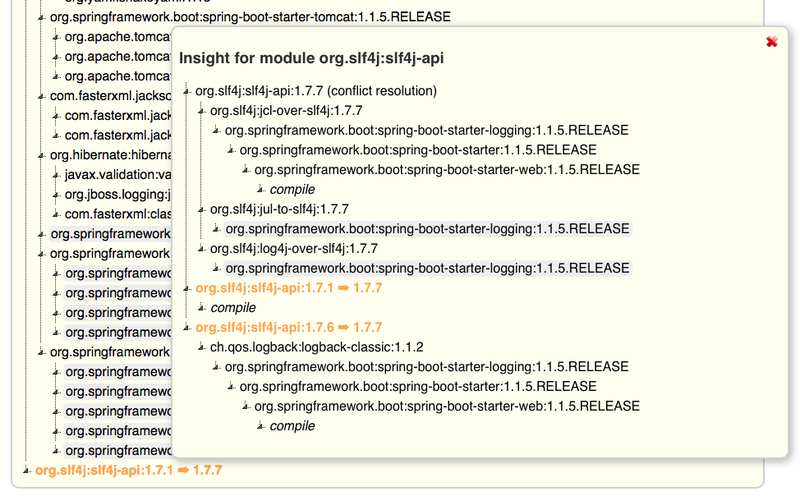 In the following sample build we define a compile dependency on Spring Boot and SLF4J API. 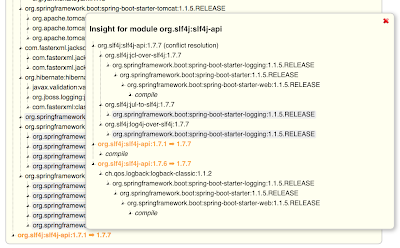 The SLF4J API is also a transitive dependency for the Spring Boot dependency, so we can see how the dependencyInsight tasks shows a version conflict. // Set Bintray JCenter as repository. // Set dependency for SLF4J with conflicting version. In the output we can see slf4j-api is referenced three times, once as a transitive dependency for jcl-over-slf4j, jul-to-slf4j and log4j-over-slf4j, once as transitive dependency for logback-classic and once as a direct dependency for the compile configuration. We also see the version is bumped to 1.7.7 where necessary, because the transitive dependency of jcl-over-slf4j defines the newest version. The value we use for the --dependency option is used to do partial matching in the group, name or version properties of the dependencies. For example to see an insight in all dependencies with logging we can invoke $ gradle dependencyInsight --dependency logging.